The public comment period is officially CLOSED! Thank you for your support! There are many other ways to help the Reserve: learn how. We are asking the federal government to provide access for bison to graze over 250,000 acres of public lands where the Reserve has grazing privileges. The public has until June 11 to submit comments to the Bureau of Land Management (BLM) in support of this proposal. Please note that all submitted comments become public information and may be shared or published by the BLM. We have drafted a series of topic documents to provide in-depth information on the five areas that APR believes to be most important for the BLM to consider. You are welcome to copy content directly from the linked documents for use in your own comment, and we encourage you to share the information with your family and friends. Be sure to reference your trip or visits to the Reserve (if applicable) and note the area businesses that you supported during your stay. 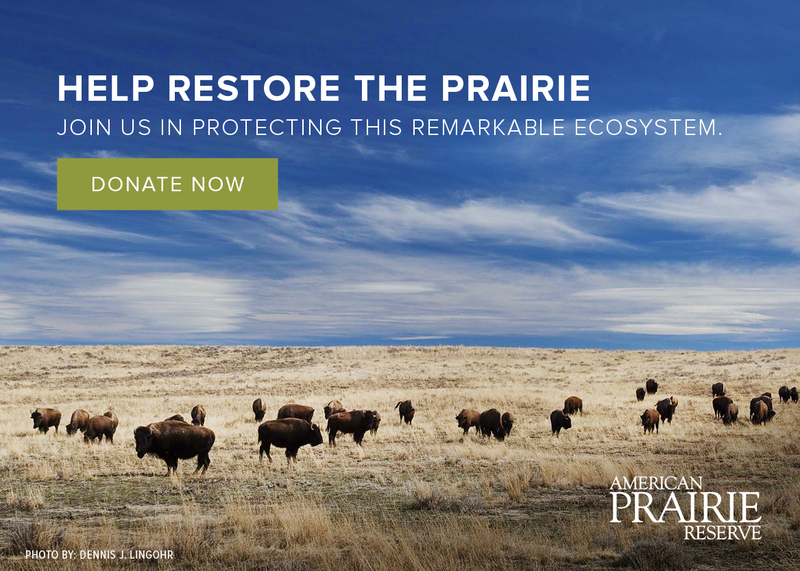 Also, to ensure transparency, mention in your comment your relationship with American Prairie Reserve and/or its employees (if applicable). This proposal will maintain rangeland health and will restore wildlife and riparian habitat. Grasslands in central and northeast Montana evolved with the presence of bison. This proposal will restore historic and natural grazing patterns that occurred. Removing interior fences and allowing bison to graze naturally will help the BLM meet or exceed rangeland health standards, restore riparian areas, and improve wildlife habitat and migration. Read more about the ways the proposal contributes to Healthy Range and Healthy Wildlife. This proposal will help America restore the National Mammal. With growing interest in restoring the National Mammal, this proposal will facilitate the growth of a strong source herd that may be used to assist tribal, federal, state, and other conservation efforts to restore bison in other areas of America. Read more about the ways the proposal Restores the National Mammal. This proposal will drive visitation to public lands and will fuel outdoor recreation. The expansion of an American bison herd will increase visitation in the region for wildlife watchers and outdoor enthusiasts. In conjunction with the Reserve’s long-term goals of improving public access in the region and building a more robust outdoor recreation infrastructure, the proposal will help to restore wildlife habitat and therefore improve wildlife hunting opportunities. Read more about the ways the proposal Fuels Outdoor Recreation and Multiple Use. This proposal will help diversify the regional economy. Gradually expanding the size of the bison herd will have a minimal impact on traditional agriculture, but can help diversify the region’s economy. American Prairie Reserve is already a significant contributor to the local economy by creating jobs and investing in the region. That, combined with new tourism and visitation, can help offset ongoing economic changes and fluctuations in the region. Read more about how the proposal Diversifies the Economy. This proposal can help Department of Interior with some of their priorities regarding recreation, wildlife restoration, and big game migration. The proposed action can help BLM achieve several high priority orders issued by the Department of Interior to improve habitat quality, increase hunting and outdoor recreation opportunities, and improve western big game migration corridors. Specifically, through the proposed action, American Prairie Reserve can assist DOI in achieving orders #3362, #3356 and #3347. Read more about how the proposal shows Consistency with some DOI Secretarial Orders. The Bureau of Land Management website contains information about the National Environmental Policy Act (NEPA) process, the proposed action from American Prairie Reserve, a summary of the action, and maps relating to the proposal (including property maps and fence proposal maps). If you have questions, read the Frequently Asked Questions or email Betty Holder at American Prairie Reserve– you also can leave a message for Betty at 406-585-4600 ext. 805. The BLM will be accepting public comments until June 11. You may use the links above to access email forms to submit your comment, you can compose and send your message from your personal inbox (send to blm_mt_scoping_ncmd@blm.gov with the subject "APR Scoping Comments") or you can mail your written comment to: APR Scoping Comments, Malta BLM Field Office, 47285 US Highway 2, Malta, MT, 59538. Please note that all submitted comments become public information and may be shared or published by the BLM. Comments will be accepted until June 11.